Save Event: Be the Revolution! 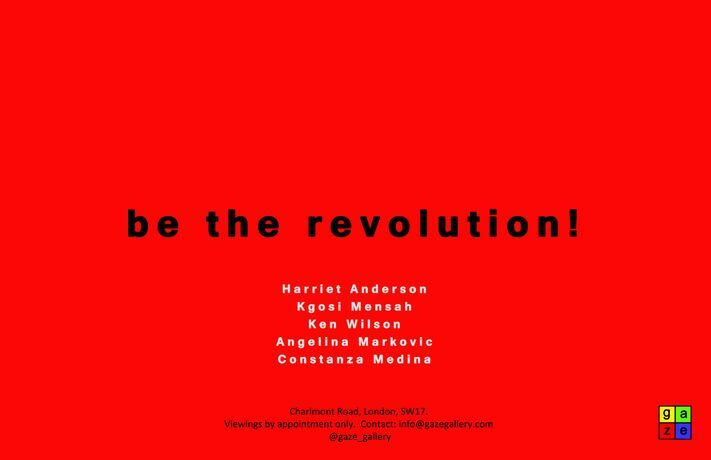 Following an overwhelming submission of proposals for phenomenally provocative new work here at Gaze, we have invited five artists to take part in a group show. But this is a group show with a twist. We believe that uncollaborative group shows cannot provide the necessary platform for artists and audience to fully explore the artwork. So each artist will show their work consecutively, creating a fast-paced narrative of solo shows. We look forward to welcoming Harriet Anderson, Kgosi Mensah, Ken Wilson, Angelina Markovic and Constanza Medina to Gaze. This is a big challenge for the five artists and for us here at Gaze, but we have all agreed that taking risks is what we are here to do. The first exhibition in the series will open on Thursday 15 November with the following exhibition opening two weeks later on Thursday 29 November and so on.